The following policy brief by Joel Albers on the Affordable Care Act is well worth the read. As I noted in an earlier post, the U.S. Supreme Court decision upholding the ACA is a pyrrhic victory. The analysis that follows outlines some possible positive effects of the law and ways in which those of us who support a single-payer health system might take advantage of the new regulations. The U.S. Supreme Court two weeks ago upheld the Patient Protection and Affordable Care Act of 2010, Pubic Law 111-148 also known as the Affordable Care Act (ACA) of 2010. The law, enacted on March 23, 2010, consists of 10 Titles (sections), totaling 1024 pages (greater than 2000 pages including related statutes). The following analysis brief focuses on Title I : “Quality, Affordable Health Care for All Americans” (141 pages), which i believe is the most crucial section as it creates the overall framework for changes compared to current law. The two most important sections within Title I are: “Health Insurance Market Reforms” and “Individual and Group Market Reforms”. Feel free to distribute this to other individuals and lists. Does the ACA of 2010 bring improvements over current law ? -expansion of Medicaid from 100% of FPL to 133% FPL, etc. Some, but not all of the harsh “risk rating” to determine premiums for enrollees have been eliminated, including health status, occupation, and other demographic and geographic characteristics. Premiums determined by risk rating based on age have been retained yet at no greater than a 3:1 ratio. Public pressure to solve the health insurance and health care crisis, particularly by single-payer advocates combined with the plummeting of the economy in 2008, combined to bring about some of these ostensible changes and improvements. What will be the net effect of the ACA of 2010 over the short and longer term? Strategically, I believe we can work with it, mainly due to the cooperative health insurance pools provision mentioned at the conclusion of this brief. In the short-term, it will improve access and some benefits; yet, longer term, the built-in loopholes create opportunities for the industry to circumvent the progress and create fewer and more powerful insurance companies. Yet for now, the ball is at least in the industry’s court. ” the issuer of the plan may offer the nationwide qualified health plan in the individual or small group market in more than 1 State”). Currently, little to no competition in state markets exists as the dominant insurer already controls the majority of the market share (by enrollment) when taken in aggregate and individually(in most states) across the 50 states (Source: How competitive are state insurance markets ? (Kaiser Family Foundation, Oct 2011). Note that the The McCarran-Ferguson Act of 1945 also provides that federal anti-trust laws do NOT apply to the “business of insurance”. This has allowed for substantial consolidation (buyouts,mergers, aquisitions, in the health insurance industry. The largest U.S. health insurer, United Health Group’s revenues now exceed $100 billion due to takeovers of other health insurers from coast to coast since 1991. Also, health insurance companies are NOT REQUIRED to sell health insurance policies within the Health Insurance Exchange. (see p.182,SEC. 1312. “CONSUMER CHOICE”. (d) ” Empowering consumer choice”.– (1) “Continued operation of market outside exchanges —Nothing in this title shall be construed to prohibit— (A) a health insurance issuer from offering outside of an Exchange a health plan to a qualified individual or qualified employer”). This invalidates the premise of the “Exchange,” which is to standardize policies and create a competitive market by allowing consumers to compare prices, benefits, and quality thereby forcing insurers to compete. For decades just the opposite has occurred– monopoly– and more of the same is expected under the ACA. In addition, the “essential benefit” or “minimum essential coverage” (p248) assures that health insurance companies can continue deceptive marketing practices beyond the “essential benefit”, particularly to woo healthier patients and avoid those with pre-existing conditions, as is clearly the case in the Medicare HMO Advantage program (Medicare Part C). It also creates a two-tiered system in which those operating outside the Exchange are back to “wild west” conditions, while further fragmenting health care. Although under the ACA, insurance would be “guaranteed issue” and consumers are “mandated” to PURCHASE private insurance without denial of coverage due to pre-existing conditions health insurers are not mandated to SELL policies in any particular market and can drop all enrollees by exiting a market (typically designated by a given county or zip code area). Insurers can change coverage from year to year, potentially exclude a body part, or restrict enrollment periods. Essentially, the ACA law maintains the private, market-based health insurance system and includes 1. individual mandate, 2.regulations 3.subsidies and 4. adjusted community (not individual) premium rating. And although the benefits mentioned above are welcome, and look good on paper, for each benefit, the complicated 2000 plus page law builds-in loopholes, cost-shifting, and “actuarial equivalence” (these are insurance companies, what else would one expect ?). So for example, although lifetime limits on coverage, typically at $5 million, were lifted at the backend, on average, consumers will be paying a 25% co-insurance on the front end for one of four policies from which to select on the Exchange. However, “actuarial equivalence” means the insurers can distribute this so-called “cost sharing” over not just coinsurance, but also deductibles, and copayments, etc. as long as the total cost for plan-to-plan is “actuarial equivalent”. Thus, rather than standardizing and simplifying the system, the ACA further complicates and fragments it, as caused by a failed managed care micromanagement approach. Note also that many specific decisions and rulemaking still need to be established, and much of that is in the hands of The Secretary of Health and Human Services, Kathleen Sebelius, former Commissioner of Insurance for the state of Kansas. It is these Commissioners whom comprise the National Association of Insurance Commissioners, who created many of the state model legislation that served as a precursor to the ACA. The NAIC is the organization which defines terms like “pre-existing condition”, and “guaranteed issue”. Moreover, enforcement of many of the regulations such as reviewing premium rates and rate increases greater than 10%, and rebating of surpluses, are already lax in most states, including a revolving door of regulators from the industry itself. There is no sense of greater accountability within the ACA as there are too many “moving parts”. 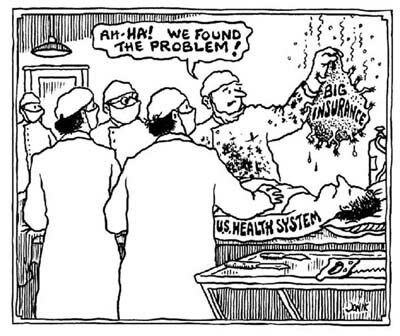 One provision, however, can give us a foothold toward a publicly-funded single-payer approach, the creation of cooperative health insurance pools within each state which can expand to other states (p187 section 1322, “Member-run health insurance issuers”). But we only won this provision as an alternative to the scrapped public option (expansion of the Medicare pool) of which there was tremendous public pressure to include in 2009. By becoming an insurer, albeit one that is self-funded, member-run and cooperative, we can take advantage of some of the provisions that would accrue to the industry, like premium subsidies, tax credits, and keep funds within our own communities, and end exorbitant CEO salaries, and profiteering. Addendum: for more practical specific questions regarding how the ACA will affect you as an individual, household, or employer, pls email or call contact info below.